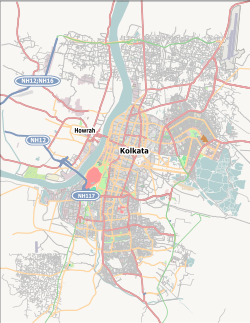 This article is about the neighbourhood of Kolkata. For the town in Purulia district, see Barabazar. Burrabazar (also spelt Bara Bazar) is a neighbourhood of central Kolkata, earlier known as Calcutta, in Kolkata district in the Indian state of West Bengal. Burrabazar expanded from a yarn and textile market into the commercial nucleus of Kolkata and one of the largest wholesale markets in India. Burrabazar (Bengali: বড়ো বাজার) is a Bengali word meaning big market. However, there is another theory. The neighbourhood was earlier named after ‘Buro’, the popular name of Shiva. The Rajasthani-speaking merchants who ousted the earlier local merchants, made it ‘Baro’ (Hence, 'Bara'). Before the British came the most powerful families in the region were Sett and Bysacks, the merchants of yarn and cloth market at Sutanuti. With the arrival of the British these families flourished with renewed vigour. Janardan Sett was a trading agent of the British. Shobharam Bysack (1690–1773) became a millionaire by supplying textiles to British East India Company. One of the earliest names floating around is that of Mukundaram Sett, who lived in the earlier part of sixteenth century and moved from Satgaon to Gobindapur. Sutanuti haat has been traced back to 1738 by Orme. In the siege of 1756, troops of Siraj ud-Daulah set fire to the market and took possession of Jorabagan and Kumortuli, neighbourhoods further north where the merchants lived. In between Sutanuti haat made way for Bazar Kolkata, some time in the 18th century. The market was spread over nearly 500 bighas and the residential area covered another 400 bighas. Apart from the Seths and Basaks, there were the gold merchants Mullicks and other men of their calibre. Their affluence and pomp are legends even in their days. There also were merchants of comparatively lesser affluence. As for example, the area around what is now Kalakar Street was known as Dhakapattys, as it was home to the Sahas, cloth merchants from Dhaka. The Sheths and Basaks had close links with such cloth producing centres as Dhaka, Murshidabad and Cossimbazar. In 1888, one of the 25 newly organized police section houses was located in Burrabazar. Burrabzar is bounded by Posta and Jorabagan on the north, Jorasanko and Kolutola on the east, B. B. D. Bagh on the south and Hooghly River on the west. Lalbazar and Bowbazar are at the south-west corner of Burrabazar. The neighbourhood is adjacent to Howrah Bridge (renamed Rabindra Setu). One description of its boundaries puts it as follows: from Posta in the north to Canning Street in the south, and from Strand Road in the west to Chitpur Road in the east. Within this rough boundary it is a world in itself. Cutting right across Burrabazar is Harrison Road, which runs straight from Howrah Bridge to Sealdah railway station. It was constructed between December 1889 and 1892, sweeping away many an overcrowded tenement and festering lane. It is of the uniform breadth of 75 feet and named after Sir Henry Harrison, chairman of the corporation, by whom the scheme was inaugurated and matured. It has been renamed after Mahatma Gandhi. Burrabazar police station is part of the Central division of Kolkata Police. It is located at 8, Mullick Street, Kolkata-700007. Taltala Women police station covers all police districts under the jurisdiction of the Central division i.e. Bowbazar, Burrabazar, Girish Park, Hare Street, Jorasanko, Muchipara, New Market, Taltala and Posta. Burrabazar expanded from a yarn and textile market into one of the largest wholesale markets in India. Burrabazar is divided into highly specialised sub-markets, according to the commodity it deals in – Dhotipatti, Fancypatti, Tulapatti, Chinipatti etc. Further subdivisions are katra, chowk or kothi. A popular saying goes, “Anything and everything is available at Burrabazar. Even the tiger's eye is available here if you pay the right price.” Each katra (market) is known for a particular item. There are approximately 25 katras in Burrabazar. At Raja Katra, which originally belonged to the Maharaja of Bardhaman, most of the shops deal in spices. At Manohar Das Katra it is mostly hardware and textile. Vikram Chand Market and Khangrapatti sell mostly electronic goods and artificial ornaments. For Diwali, the festival of lights, it is transformed into a huge market for festive and religious ingredients. The number of makeshift stalls are around 800, spread around Kalakar Street and other areas. From idols to their dainty dresses, designer diyas (earthen lamps) to saffron-tinted laddus (round-shaped sweet meat), every conceivable article can be scooped from this gala bazaar, the city’s largest assortment of puja paraphernalia. The series of shops bang opposite the Jain temple, near Satyanarayan Park, flaunts ornately decked-up idols of Ganesha and Lakshmi — the brother-sister divinities symbolising wealth and prosperity. With crime a major problem in Burrabazar till 2008, the police station had a rough time. More than 50,000 merchants from across the country have been attracted to Burrabazar because of the immense business opportunities but musclemen have followed them to the trade hub. From providing protection to businessmen and transporting their black money to running a satta (form of betting) racket and settling property and payment disputes, these men, mostly from the neighbouring states, start off as confidantes of the trading community. In a few years, they break free and form their own gangs to extort money and engage in other forms of criminal activities. Even small traders coming to Burrabazar face problems, but of a different sort. More than 1,000 cyclists cross Howrah bridge everyday to make purchases at Burrabazar. Most of these are small traders, from across the Hooghly River and they carry back goods for sale in their localities. Such people are regularly harassed by policemen on duty and let off against small payments. Slow traffic movement, congested footpaths, accident-prone roads, police-politician-hoodlum nexus and administrative apathy have become the bane of Burrabazar. Traffic in the area, including the approach road to Howrah bridge, has been a long-standing problem for people passing through the area. Whole of footpath and even around 30% of Brabourne Road is clogged by hawkers who have permanent shops on both side of roads made of tarpaulins and bamboos reducing the already sparse motarable road in the area.Pedestrians are forced to walk on roads along with vehicles . While lorries, taxis, vans, and three-wheel goods carriers crowd the main roads, slow-moving vehicles like cycle-vans and carts clog the side-streets. It often takes more than half-an-hour to cross the two-km stretch. According to an estimate of Kolkata Municipal Corporation, around 600 buildings in Burrabazar are risky and hazardous and another 500 partly risky. According to West Bengal Fire Service officials, at least 100 persons were injured in separate mishaps in which five buildings collapsed and 30 buildings caved in partially in 2007. In almost every building, 50 to 100 shops were built on each floor by erecting plywood partitions. The civic body has plans to pull down many of the unsafe buildings. On 31 March 2016, a flyover on Vivekananda Road near Burrabazar collapsed, killing 22 people and injuring many more. Along with buildings in danger of collapsing, the fire services department has fixed its gaze on structures in Burrabazar that can catch fire any moment because of faulty wiring. According to fire service officials, most of the 50-odd fires that broke out in the trade hub in 2005 were caused by short circuits, a consequence of faulty connections. At least 500 buildings in Burrabazar can be described as fire hazards. A disaster can strike any day. There are numerous building with hundreds of temporary electrical connections. Most tenants have drawn up temporary connections, ignoring all rules. These illegal and haphazard connections often lead to short circuits and fire. In January 2008, fire ravaged Nandram market in Burrabazar for nearly a week. 1,200 shops went up in flames.Three hundred fire fighters and 54 fire tenders were sent to fight the fire. More than 1,000 people, who live in neighbouring residential apartments, were evacuated. Traffic in the area was thrown out of gear. Fires are regular features in Burrabazar. In January 2000, rows of shops were gutted at Manohar Das Katra. In December 2002, there was fire in the wholesale market of woollen goods. In April 2003, fire struck Satyanarayan Park AC market. In September 2004 there was fire in a sari shop in Hari Ram Goenka Street. In July 2005, there was fire at a hosiery warehouse, off Kalakar Street. In September 2005, there was fire in a Jackson Lane warehouse filled with plastic and paper. In March 2006, there was fire in a bank on Ezra Street. A fire devastated the five floors of Bagree Market in September 2018, affecting some 500 traders, who lost 2-5 billion rupees, and about 3,000 staff. The All India Federation of Tax Practitioners organised a free helpline for the traders who lost their documents and found it difficult to prepare their accounts. Wikimedia Commons has media related to Burrabazar. ^ a b "Burrabazar Kolkata". AsiaRooms.com. Retrieved 8 February 2008. ^ a b c d Roy, Subhajoy (20 January 2008). "We didn't start the fire". With inputs from Deepankar Ganguly. Calcutta, India: The Telegraph. Retrieved 8 February 2008. ^ Deb, Chitra, The ‘Great Houses’ of Old Calcutta, in Calcutta, the Living City, Vol I, pp. 56–60. ^ Patree, Purnendu, Purano Kolkatar Kathachitra, (a book on History of Calcutta), (in Bengali), first published 1979, 1995 edition, pp.135–139, Dey’s Publishing, ISBN 81-7079-751-9. ^ "Burrabazar". Catchcal.com. Retrieved 8 February 2008. ^ Nair, P.Thankappan, The Growth and Development of Old Calcutta, in Calcutta, the Living City, Vol. I, pp. 18-19, Edited by Sukanta Chaudhuri, Oxford University Press, 1995 edition. ^ Cotton, H.E.A., Calcutta Old and New, 1909/1980, p. 282, General Printers and Publishers Pvt. Ltd.
^ a b "Kolkata Police". Central Division. KP. Retrieved 9 March 2018. ^ Devadeep Purohit, and Reshmi Sengupta (1 November 2002). "Shop site for fest of lights". Calcutta, India: The Telegraph. Retrieved 8 February 2008. ^ "Bowbazar Police Station". Kolkata Police. Archived from the original on 16 April 2007. Retrieved 8 February 2008. ^ "Five on loot spree in Burrabazar flat". Calcutta, India: The Telegraph. 4 January 2008. Retrieved 8 February 2008. ^ Siddiqui, Imran Ahmed (8 February 2007). "Crime shadow on trade hub – Musclemen from neighbouring states run extortion, robbery & gambling rackets in Burrabazar". Calcutta, India: The Telegraph. Retrieved 8 February 2008. ^ "Rights rap & probe – Traders blow the whistle on cop coercion". Calcutta, India: The Telegraph. 26 January 2005. Retrieved 8 February 2008. ^ Gomes, Julius (15 February 2005). "Traffic trouble at business hub – Burrabazar traders complain of administratirve apathy". Calcutta, India: The Telegraph. Retrieved 8 February 2008. ^ "Raze-rebuild for trade hub tinderboxes". Calcutta, India: The Telegraph. 4 March 2006. Retrieved 8 February 2008. ^ "22 killed, scores trapped, after Kolkata flyover comes crashing down". Hindustan Times. 31 March 2016. Retrieved 31 March 2016. ^ "Trade hub houses wired for fire". Calcutta, India: The Telegraph. 6 March 2006. Retrieved 8 February 2008. ^ a b "Ahead of Durga Puja, Bagree Market traders stare at gloom as fire guts biz". Business Standard. 17 September 2018. Retrieved 4 October 2018. ^ "Pandal blazes on the wane". Calcutta, India: The Telegraph. 30 January 2006. Retrieved 8 February 2008. ^ "Bravehearts who fought blaze". Telegraph India. 21 September 2018. Retrieved 4 October 2018. This page was last edited on 18 April 2019, at 05:27 (UTC).